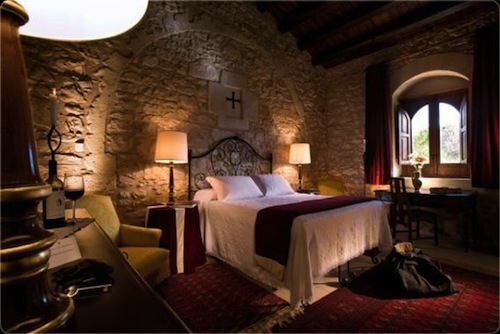 Eremo della Giubiliana Boutique Hotel is an exclusive 5-star resort housed in a fortified convent once occupied by the knights of Malta in the 15th century. The hotel is located a few kilometers south of Ragusa. Very old thick white stone walls surround and protect the courtyards and inner structure. Its white tower stands tall and overlooks the plateau that gently slopes towards the sea and there are miles and miles of coast as far as the eye can see. Across, on clear days, you can see the island of Malta and the African Coast. The estate used to be part of the old ecclesiastical feudal hold of Renna dating from the 12th century, and was an old Arab rural home. The Knights of the Order of San Giovanni, stationed in the nearby island of Malta, used the Convent structure in the first half of the 16th century. In the 18th century, the Eremo was acquired by the Nifosì, a wealthy land-owner family of the plateau. The present heiress, Vincenza Jolanda Nifosì, has decided to restore it, and in this way continuing with the family tradition by opening the estate as a rural destination and personally managing Eremo della Giubiliana as a splendid 5-star hotel in Ragusa. The rooms have all the comforts including, telephone, TV, air conditioning and private bathrooms. 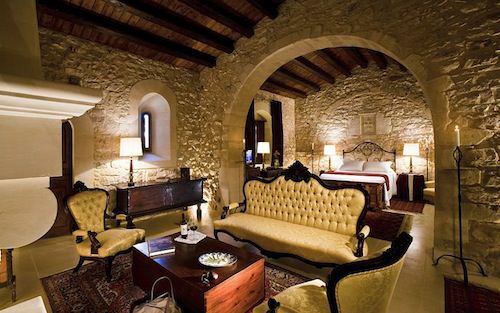 They are furnished with antique Sicilian style furniture and original household goods which make them quite different from the usual bland hotel bedrooms. The great arched hall of the ancient refectory used by the Knights of the Order of Saint John is the setting for the Don Eusebio Restaurant. The hall opens wide its French windows towards the south to reveal a spectacular view of parkland strewn with twisted olive trees, set on a backdrop of the Mediterranean sea and the distant Maltese isles. Paintings by 16th century Sicilian artists, ancient kneading troughs and a long refectory table complete the furnishings of this refined and suggestive ambience. Dogs are welcome in the hotel and are free to roam around the estate.